I do a lot of liking or ♥-ing on Twitter. Sometimes it’s to acknowledge a tweet or a reply. Often it’s so I can go back and look at whatever is in the tweet in greater detail later. Do I do this? Not as often as I would like. So, I’m going to do it now in front of everyone. I’m currently working in the Agriculture Building on the U of S campus as liaison librarian for the College of Agriculture and Bioresources and the School of Environment and Sustainability. So, I’ve upped my game in terms of following Ag stuff on Twitter. I’ve favourited a couple of tweets from the Livestock & Forage Centre of Excellence @LFCE_usask. This state of the art research facility had its grand opening on October 9. @myleejoseph tweeted a link to an article entitled Using ORCID, DOI, and Other Open Identifiers in Research Evaluation. A timely topic and an interesting read. If you’ve wanted to know more about research data management (RDM) @NewRevAcadLib posted a link to a new literature review on librarians and RDM. This paper has been posted in its accepted version and I hope it’s not behind the T&F paywall. @AprilHathcock posted two pictures from the 3rd National Joint Conference of Librarians of Color. The pictures are the two pages of a selected bibliography shared during a session pertaining to Indigenous research methodologies. @katelangrell announced that the 2019 ABC Copyright Conference will be held at the University of Saskatchewan in Saskatoon. Save the date: May 30-31. The Call for Papers/Posters is out for the 10th International Evidence Based Library and Information conference (@ConfEblip) #EBLIP10 Who doesn’t want to go to Glasgow, Scotland in June of 2019??!! You have till November 30 to get your submissions in. That’s my selection of faves for now. I find Twitter so useful for keeping up professionally and for pushing out information to my liaison areas. With bright sun and shorts weather arriving on the BC coast, my thoughts have turned to summer plans. With fall and winter terms being way too hectic to put much sustained attention to professional development (PD), spring and summer is the time to take a few days and learn new skills. Aside from the conference circuit and catching up on recent publications, one of my favourite ways to spend PD time is doing massive open online courses (MOOCs). I love MOOCs because 1) they allow me to learn about a wide range of topics, 2) they’re free, and 3) they’re low commitment – if I don’t like the course I just drop it and find another, or only take the part of the course I’m interested in. For this blog entry, I thought I’d review some free courses relevant to librarians engaged in evidence-based practice. A psychology course might seem an odd choice for librarian PD at first, but I found this one particularly useful to understand why people do what they do, which has implications for everything from library space design to designing effective assessment activities. Taught by Dr. Scott Plous, this is an engaging introduction to social psych. Project management skills are seriously helpful in a library environment. If you’ve never taken a course in project management, consider this one. It’s free and available on-demand (i.e. no start/end dates, no deadlines). Once you’ve got evidence of good stuff happening in your library, the next step is to communicate your awesomeness to your stakeholders. Good marketing skills really help. Wharton is known for their marketing expertise, so why not learn from the best? This course started June 1. Lots of people have training in giving First Aid for physical injuries, but what about people who need immediate psychological assistance? This course doesn’t qualify you as a psychological first responder, but it does give an introduction to the subject. The five courses above are ones I see a direct, useful connection to my job as an Assessment Librarian. There are plenty of MOOCs out there for people who want to learn about a whole variety of subjects. If you’re looking for a PD opportunity this summer, why not check out a MOOC? My favourite MOOC sites are Coursera, FutureLearn, and edX. Have you found a great MOOC? Have you tried MOOCs before? What do you do for PD? Please share in the comments below. I first did a post of my Twitter faves back in on August 12, 2014. It was summer. There was no snow, no cold…there were birds and insects and warm soft breezes. Perhaps I just want to recapture those feelings here in frigid November but I figured I’d dip into my Twitter faves and see what I need to catch up on. • August 28 saw the retirement of Carleton University Librarian, Margaret Haines. @CU_Discovery tweeted an awesome photo of Margaret living her final wish: to drive the library tunnel cart! • One of my favourite blogs, The Impact Blog from the London School of Economics and Political Science blogged about how faculty learning communities are a positive way for libraries to engage academic staff in scholarly communication. • @JMBurns99 tweeted a link entitled What is Critical Research? It goes to an interesting and informative page from the University of Strathclyde, Humanities and Social Sciences. Here are a few of my favourite tweets that don’t include links. They’re helpful (and sometimes funny) all by themselves! 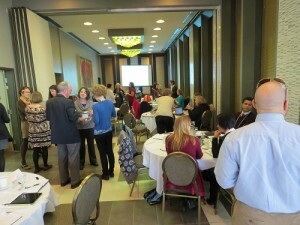 • October 15 saw the first annual C-EBLIP Fall Symposium: Librarians as Researchers. @tmmaddison tweeted: #ceblip2014 Throughout the day, I found it hard not to run out of the room and immediately start researching. So many interesting topics! I continue to find Twitter useful for CPD, as well as interesting, informative, and fun! If you haven’t made a foray into the Twitterverse yet, try it! I tweet as @VirginiaPrimary and I also tweet for the Centre for Evidence Based Library and Information Practice @CEBLIP. I click on a lot of stars on Twitter. Clicking on the star marks a tweet as a favourite and the idea is that I will go back to these favourites and read whatever it is that first interested me in more depth. Most often, these faves include a link to a blog post or an article that I don’t want to lose track of. What I’ve found is that while well-intentioned, I rarely go back to these stars and explore further. To that end, I’m going to dig through my Twitter favourites and include some of them here. This will serve as double duty: I can get a look at these fascinating links that sparked something in me when I first saw them and I can share them out to hopefully spark you as well. Here we go! Here are a few of my favourite tweets that don’t include links. It’s amazing how helpful a 140-character (or less) post can be! • @MariaJGrant: Writing Tip: The *perfect* word/sentence isnt essential to communicate ideas but words/sentences are. Write them down & start communicating! • @bfister: I think librarians can and should be awesome themselves, not just invisible team members. • @LibSkrat: I’ll say this as often as I need to: judging a person’s career by the JIF of the journals they publish in is unethical and stupid. I find Twitter to be an excellent way to keep up professionally. I created my account in 2009 (@VirginiaPrimary) but it took me a few years of only tweeting at conferences to really jump on board and make it part of my daily routine. On June 9 over lunch, the C-EBLIP Journal Club met for the first time with 9 librarians in attendance. The plan is to meet every 6 weeks or so, and dates have been set until May 2015 to get us going. The club will run around rotating convenors, with the convenor’s role being to choose an article to discuss, book the meeting space, send out meeting announcements and reminder emails, lead the journal club discussion, and write up a discussion summary for the blog. I convened the first meeting and here’s how it went. This is a qualitative study using grounded theory methodology that addresses these research questions: What forms of evidence do academic librarians use when making professional decisions? Why do they use these types of evidence? How do academic librarians incorporate research into their professional decision making? Koufogiannakis recruited 19 academic librarian participants using purposeful sampling (in other words, she looked for a particular population – librarians who “had some interest in exploring the use of evidence in relation to their professional decision-making” (p. 8)). These librarians kept a private blog diary for a month, noting questions or problems related to their professional practice and how they came to resolve those issues. She followed up with semi-structured phone interviews which enabled her to clarify and get a deeper analysis of specific aspects participants noted in their diaries. The results of this study include two variations of evidence: hard and soft, and the librarians in the study used both kinds to inform decision-making. They often didn’t think of the soft types of evidence as real evidence, but were using them in conjunction with the harder forms of evidence such as the research literature to inform their practice. The piece concludes with the idea that EBLIP needs to expand to include a wide variety of evidence types to “bring the EBLIP model closer to one that has truly considered the needs of librarians” (p. 21). In retrospect, it is a difficult process to fully participate in a journal club discussion and to take notes for some kind of discussion summary after the fact. The following discussion points are highly contextual. The journal club discussion was informal and conversational, allowing us to take different roads. • The discussion began with general impressions of the article and these impressions included praise for the clarity of the writing and an appreciation for the articulation and demonstration of material that at first glance seemed obvious but upon deeper reading revealed itself to be thought-provoking and meaningful. • There was some discussion about the sample of librarians who participated in the study – how was that sample generated, were the librarians similar to the researcher, what would be the implications of that? • The article takes a broad view of what is considered evidence. A comment was made that we are still so uncertain and that the article highlights an ongoing struggle. Other people may not accept the soft evidence. As librarians we can evaluate sources and all have the potential to have something to offer. Where it can get complex for us (as librarians) is the fact that we serve other research communities. We sometimes inherit those value systems through that work. • There was a comment about the reflective nature of the research and someone commented that the humanities are doing the same kind of introspective things. • The discussion moved to evidence based practice in health/medicine. In many models of EBP, the focus seems to be only on the research and not the other two aspects (professional knowledge/expertise; user/client/patient preference). • Why aren’t librarians going to their associations for information/evidence, i.e. ACRL – tools, checklists, etc.? • Is soft evidence used in the absence of hard evidence? After this question arose, there was a discussion around the designations of the terms “hard” and “soft.” Is the designation imposing some kind of bias? These are not neutral terms. Why have we as a culture or a society determined a hierarchy for these terms? What other terms might have been used to classify these two types of evidence? We couldn’t come up with anything that wasn’t hierarchical to some extent, and we put that down to the idea that we are organizers by nature. • Tacit knowledge: gut reactions help to pose the questions which ideally we go on to explore. The impetus to “prove it” helps to solidify thoughts. We often don’t believe our own knowledge is good or that it’s appropriate proof. • We need to get away from the idea that right and wrong are forever. Need a new standard that allows for new knowledge and flexibility. This was a great article with which to kick off the C-EBLIP Journal Club. Not only did we discuss the particulars of the research reported in the article, it also acted as a catalyst that sparked a professional discussion that we may well not have had without it about how we practice as librarians and what it means to practice in a evidence-based way.